Mealybug infestations appear on plants as tiny, soft-bodied insects surrounded by a fuzzy, white mess around the stems and leaf nodes. Mealybugs are common indoor pests. The visible mealybugs are the females. They are small (about one-tenth of an inch) insects with fringes around their bodies and, depending on the species, twin tails. Male mealybugs are tiny winged insects that are rarely seen on plants. 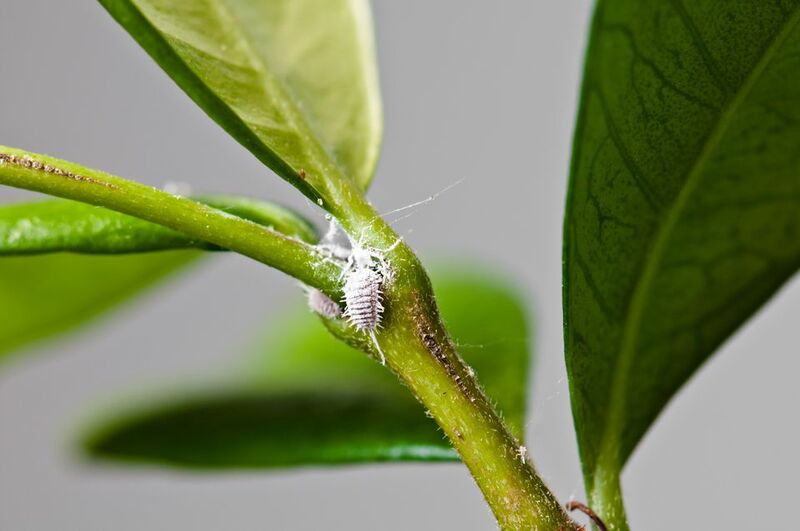 The main species of mealybugs are longtailed mealybugs (Pseudococcus longispinus) and citrus mealybugs (Planococcus citri). Control methods for both species are similar. Mealybugs are related to scale insects. They cause damage by sucking the juice from their host plants. Like many pests, mealybugs tend to favor new growth. Over time, their damage causes the leaves to yellow and eventually drop from the plant. They can also cause fruits, vegetables, and flower buds to prematurely drop off. In a bad infestation, their waxy excretions (also known as honeydew) encourages the development of sooty mold fungus. Female mealybugs hide their eggs in the fluffy white excretions. Eggs hatch in about 10 days, producing crawlers or nymphs. The nymphs relocate to another part of the plant and spend another 4 to 8 weeks developing into the adult form. Like most pests, the best control for mealybugs is defensive. Healthy, vigorous plants are less susceptible to infestation than weak, underpotted, and stressed plants. As a general rule, make sure your plants are healthy, and you're less likely to attract these annoying critters in the first place. Wash them away: Mealybugs can be dislodged with a steady stream of water. Repeat the treatment as necessary. This is best for light infestations. Neem oil: Neem oil is derived from the neem tree. Use according to label instructions. In addition to its insecticidal properties, neem is also a fungicide and has systemic benefits (meaning the plant absorbs it so it can control insects it doesn't directly contact). According to the Environmental Protection Association, neem is safe for use on vegetables and food plants as well as ornamentals. Kitchen insect spray: This all-purpose insect spray was developed by the editors of Organic Gardening magazine and came to me by way of Rodale's Organic Gardener's Handbook of Natural Insect and Disease Control. To make a batch, combine 1 garlic bulb, 1 small onion, and 1 teaspoon of cayenne pepper in a food processor or blender and process into a paste. Mix into 1 quart of water and steep for 1 hour. Strain through a cheesecloth and add 1 tablespoon of liquid dish soap. Mix well. The mixture can be stored for up to 1 week in the refrigerator. If an infestation cannot be controlled after two or three weekly applications of insecticide, consider destroying the plant before the mealybugs spread to other plants in your home.